November has witnessed an escalation in the number and gravity of the attacks targeting media freedoms in Palestine in comparison with the preceding month. In November 2018, the number of attacks monitored by the Palestinian Center for Development & Media Freedoms-MADA totaled to 57 attacks, 49 of which were committed by the Israeli occupation; while only eight attacks were committed by various Palestinian authorities in the West Bank and Gaza Strip. It is worth mentioning that the preceding month has witnessed 42 attacks committed by the Israeli occupation, 34 of which were committed by various Palestinian authorities in the West Bank and 8 attacks in Gaza Strip. The Israeli Occupation Forces have significantly escalated their attacks against media freedoms in Palestine and committed a total of 49 attacks in the West Bank and Gaza Strip, most of which fall under the serious attacks against media outlets and journalists. 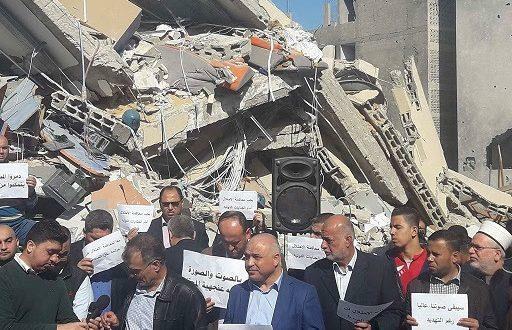 Most notably and serious among these attacks is destroying the headquarters of Al-Aqsa TV, composed on five floors, located in Gaza Strip, where 220 staff members are working. The resulting losses were estimated at about 4 million dollars (according to the director, Ibrahim Thaher). In addition to destroying the headquarters of Al-Aqsa TV by the occupation army, eleven journalists were injured by the Israeli Occupation's bullets and bombs while they were covering various events in the West Bank and Gaza Strip, namely: Ahmad Issam Shaqoura, injured by a rubber-coated bullet in his head, Ibrahim Ahmad Darwish Al-Madhoun, injured by a rubber bullet in his face, Tala'at Osama Tala'at Mushtaha, injured by a metal bullet below the knee, Rashid Saed Khaleel Rasheed, injured by a bullet in the left leg, Ahmad Khamees Jassir Hasaballah, injured by a metal bullet in his left arm, Safinaz Baker Mahmoud Allouh, injured by a metal bullet in her left hand, Mohammad Hazem Al-Masri, injured by a gas bomb fired directly at his face, Mohammad Yousef Mohammad Mohawesh, injured by gunshot fragments in his right leg, Ismail Khaleel Ismail Hamada, injured by a gas bomb in his face, Abdelraheem Abu Mahadi, injured by a gas bomb in his right arm, the American journalist, Stephon Lamont, injured by a rubber bullet in his leg while he was covering a peaceful march against settlement in Al-Mughayyir, in Ramallah, not to mention that few days prior his injury, he was also deliberately and directly shot by one of the settlers while he was filming a site threatened with the establishment of settlements, in Al-Mazraa Al-Gharbiya, where the settler arrived on a horse, and asked him, and his colleagues, at gunpoint to leave the site (he was carrying a Colt 45), then he started firing at them deliberately and directly, with the intention to kill or injure them. He fired 8 gunshots in fifteen minutes, all of them (including Stephon) ran to take shelter from the bullets behind a concrete wall 'however, the settler fired two bullets, directly and deliberately at me, even though I posed no threat, as I was carrying my camera in my hand and my press card around my neck' as Stephon stated to MADA, stressing that it could have end with a tragedy. Furthermore, the Israeli occupation police and army, during this month, have arrested four journalists. This is in addition to suppressing a march for journalists at Qalandya Checkpoint, at the entrance of Jerusalem, aimed at affirming the journalists right of movement, with the participation of a number of officials from the International Federation of Journalists, which led to the injury of at least nine journalists with severe suffocation, including Philip Lorient, the President of the International Federation of Journalists, Younis Mujahed, the Vice President of the International Federation of Journalists, Abdullah Al-Wahab Zughailat, the Head of the Freedoms Committee at the International Federation of Journalists, the journalist, Adriana, a member in the International Federation of Journalists Executive Board in Colombia, the Chairman of the Palestinian Syndicate of Journalists, Nasser Abu Baker, and a number of members of the General Secretariat at the Palestinian Syndicate of Journalists. In November, a total of 8 Palestinian attacks against media freedoms (three of which were committed in the West Bank and five in Gaza Strip) were monitered. This is a similar number to what has been monitered in the preceding month, October. Five attacks were committed in Gaza Strip: summoning the journalist, Abdullah Issa Ibrahim Miqdad, and questioning him on the charge of 'misusing the technology means', summoning and detaining Ihab Al-Fasfous, and questioning him twice about his posts, preventing Palestine TV staff from covering two separate events. As in the West Bank, three attacks were committed, namely: preventing some journalists, by security officers in Ramallah, from covering a peaceful sit-in in solidarity with the Yemeni people protesting against the war in Yemen, damaging photographic equipment for a group of media students of Birzeit University who were about to prepare a training report for their Faculty.